Saying that his county has become a drug hub fueled by Mexican cartels, a North Carolina sheriff announced plans for the county to re-engage with Immigration and Customs Enforcement (ICE), a report said. Alamance County Sheriff Terry Johnson told county commissioners on Nov. 19 that he is rejoining the ICE 287(g) program, which allows local agencies to perform immigration enforcement, the Raleigh News & Observer reported. ICE will be rented space in the Alamance County Jail to house detainees being deported, Johnson said, adding that ICE will pay the county about $66 per detainee per night. Johnson’s move elicited immediate charges of “racism” from the Left. 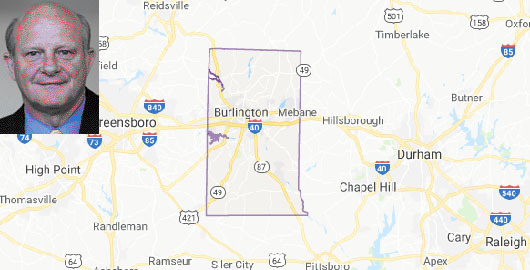 Johnson said Alamance, which is in north central North Carolina, has become the drug-trafficking hub of the Southeast. Jose Perez, who owns a small tire shop in Burlington, told county commissioners he was robbed five times in 2007, but never reported the crimes because of his fear of ICE, the News & Observer report said. Johnson said his department does not ask crime victims if they are in the U.S. illegally.